I’d like to thank Latisha Yoast, another DT member from Scrapbook Adhesives by 3L, who invited me to participate in this HUGE New Year blog hop. Her reasons for organizing this hop are heartfelt…. 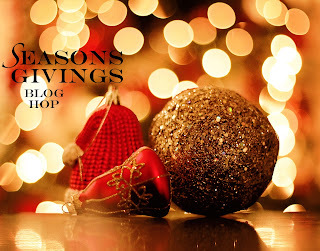 let’s start out the new year by showing gratitude to our blog readers and offering giveaways. What an awesome way to begin 2014! There are so many chances to win because each blog involved in this hop is hosting a giveaway! My GIVEAWAY: 3 collections from Fancy Pants Designs! So pour yourself a cup of tea, enjoy the hop and good luck! Happy New Year! Great Opportunity. Thanks for the chance to win!!! Love your card, Kelly. Happy New Year. The best of everything to you. Love your artwork, thank you for sharing and thank you for the opportunity to win blog candy as well. Happy New Year! Great Hop…TFS! My 2014 resolution is to SHARE more. Happy New Year and blessing throughout the new year! Happy New Year! Super fun card, thanks for the awesome giveaway! Happy New Year and Happy Crafting in 2014!! WOW! Your card is really an eye-catcher! So shimmering and glimmering I love it! I’m a new follower here on your blog! Kelly, thanks for the chance to win! Happy New Year! I like the sparkle on your card! WOW, great prize. Happy New Year! I love your glitzy card! It’s fantastic! Happy New Year, Kelly! Thanks for the chance to win! Wishing you the best for health and happiness in the New Year! Thanks for an opportunity to win your great prize package. Happy New Year Kelly. Your card suits you, bright and sparkly LOL I have my cup of coffee and am off to visit on this hop. Love your fun sparkly card! Have a great new year! Beautiful card as usual, Kelly!! Happy New Year! I love your card. So fun and festive and bright. Just like you! Happy new year, Kelly! YOU are so generous! Thank you for this awesome prize! Love your New Year’s card. So glittery and pretty and I love that you combined both gold and silver on it. Happy new year to you! What a beautiful and sparkly card! And thanks for the giveaways!!! Happy New Year!!! Happy New Year! Thanks for sharing the fun, glittery card. Happy New Year to you. Sorry I can’t add fireworks. Love your card. If I win your prize I’ll give it a good home. thanks for sharing. Love your sparkly card and appreciate the inspiration!!! Hope you have FANTASTIC craft year! This blog hop is awesome. Thanks for the chance to win. Everyone is so gracious. What a lovely new years card! Happy New Year & thanks for the chance to win! Wishing you all a happy new year of crafting fun! Love all the sparkle on your card!! Great giveaway!! What a wonderful, festive, sparkly card! Happy New Year! Such a beautiful sparkly card! Happy New Year! Thanks for the chance! What a fun sparkly card! Fab giveaway too! Love the bling on your card! Happy New Year, thanks for the chance to win a fabulous prize! I am a follower now and also following on bloglovin. Love your design. I subscribed to your You Tube, happy 2014! Happy New Year!! Thanks for a chance to win! The Blog Hop is a wonderful idea. thank you for the chance to win. Love the card – Happy New Year! Love New Years card. Thanks for the opportunity. Love the inspiration. Hi, Happy New Year, thanks for the chance to win. I am enjoying the blog hop on this lazy New Year’s Day. Love your sparkly New Year’s card. Very pretty card love the sparkle. Thanks for a chance to win and Happy New Year! Happy New Year, Thanks for the chance to win. happy 2014. thanks for sponsoring the hop. Kelly, excited to be your new follower! Fabulous card. I’m a follower. Thanks for the chance to win. Super fun card. I am now a follower. Happy New Year to you and your family. Great giveaway! Thanks for participating in this awesome hop! Happy New Year! Fabulous giveaway. So fun and sparkly! Happy 2014! oh my goodness. thank you for the continued inspiration. blessings!!! Happy New Year!!!! Fun prize!!!! Great New Year card! Happy new year. Love the card great papers. Love your sparkly new year card!! Thanks for the chance to win some great papers! Happy New Year Kelly! 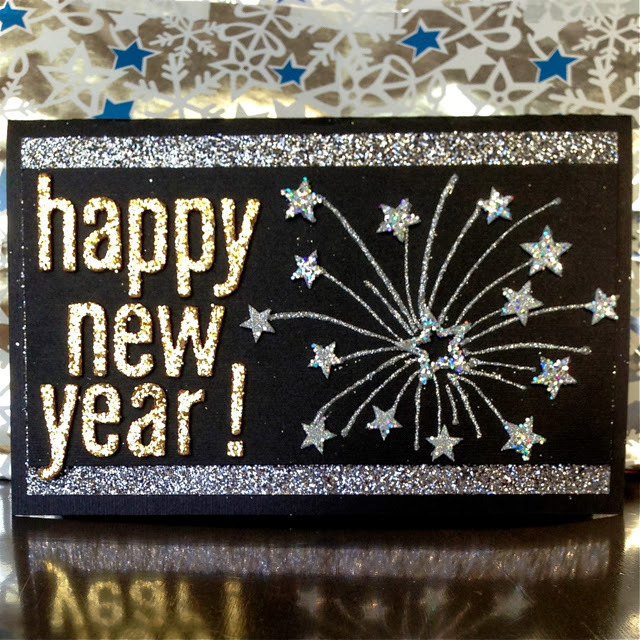 Love the glitz on your New Year card! Thanks for sharing. Wow! Your card is definitely a too”happy” card. Thank you for sharing in the blog hop! Happy New Year and many blessings in this year! Very festive and sparkly card! Happy New Year Kelly! Nice card! Hey, I just looked at that card on there blog, great job! I love the glitter and stars together. Thanks for a chance to win. I am so grateful for this blog hop. I have found so many blogs that I didn’t know of before the hop. Have a blessed 2014! Thanks for the chance to win! I’m thinking Spring when I look at your prize package. Thanks for participating and sharing your 2014 card. I love the “bling it brings”. Love your packages! Thanks for a chance to win! Super prize giveaway and a great blog hop…I’m discovering so many great new blogs to follow! Happy New Year! Great giveaway! Thanks for the chance to win it! 🙂 Happy 2014! Happy 2014! Thanks for being part of the hop! Thanks for the chance….Happy New Year! Kelly, THANK YOU so much for sharing your beautiful art & talent with us all! I hope that 2014 brings much happiness and success your way! Love your sparkly New Years card. Thanks for an opportunity to win your giveaway. Happy New Year to you. Happy New Year and thanks for the opportunity to win. A very happy and festive card! Love it. to win your great prize! oooo . . . so sparkly!! Just perfect for ringing in the new year! And such a great prize of paper. I am trying not to buy any new paper until I have used up some oooooollllllldddd stuff. But that doesn’t mean I won’t use it if it is given to me. : ) Thanks for the chance to win. This blog hop has been so much fun! Thank you for a chance to win! Thanks for the great giveaway! Have a Happy New Year! Great card!! I wish you a Happy New Year! Thank you for the chance to win tis amazing giveaway! This is a great blog hop. Its insane. Love the card. Thank you for the opportunity to win such nice prizes and I am looking forward to more inspiration in the coming year! Wow, great way to start off the year with awesome candy. Thanks for the chance to win. Happy New Year! I am having a great time hopping. Your prize is awesome and I thank you for a chance to win. Happy New Year to you! What a fun card! I hope you have a wonderful New Year! Thanks for the opp to win! What a fun sparkalicious card! Bright and sparkly card for a bright and sparkly new year! Thanks for being part of such an amazing hop! New Year blessings! The best part of blog hops if finding wonderful talent!!! thanks for the chance to win! I am hopping along! Nice card! thanks for the chance to win! Happy New Year and thanks for the chance to win a great prize package! can’t have too much paper, righrt? Thanks to all you bloggers who continually offer fresh inspiration to the rest of us. I appreciate all of you. A Happy and Blessed New Year to you and yours! HAPPY NEW YEAR! I’ve so enjoyed hopping along with you. Thanks so much for the great inspiration and the chance to win such a fabulous prize package! Love your New Year card! Thank you for the chance to win on this amazing blog hop! What a great idea this hop is – I am really enjoying it. woo hoo! Happy 2014 to you and wishing you a year of crafty fun! Thanks for the chance to win! Love the sparkly New Year card!! Great hop so far. Perfect prize package. I’m a paper hoarder. I love getting paper lines to make things out of later. Thanks for the chance to win it. Such a FUN card! 🙂 Happy New Year! Fun card – and fun blog hop! Happy new year! Love all the sparkles on your card! Thanks for the chance to win! Love your shiny New Year card! Thanks for the chance to win! Happy New Year and thanks for the great giveaway! Happy New Year!! Thanks for a fun blog hop! This is a huge blog hop and I love it! Thank you so much! This is so fun and glittery, I love it! Thanks so much! Gorgeous card! Love the bling! So glad I found your blog and found you on Pinterest. I can see lots of creative inspiration already! Wow, that is gorgeous and sparkly! Love this blinged out New year’s card Kelly! I remember your card from a few days ago on the Crafty Power Blog. Loved it there and love it here!!! Simply spectacular. How lovely of you to offer such wonderful blog candy. You did not twist our arms by requiring us to become followers in order to be eligible (which is SWEET BEYOND WORDS! ), but I am a brand-new follower by Google Friend, nonetheless. Yippee!! Happy New Year! Beautiful designs. Wonderful giveaway…love to win this!!! Fancy Pants! Love your blog candy giveaway, would be thrilled to win. also love the glittery excitement of your fabulous New Year’s card! Just wanted to stop by and wish you a Happy New Year! So glad to have you on the hop! Wonderful card love your work! The giveaway is great, thanks for the chance to win! Hi Kelly – I do love all the sparkles on your card and thank you for participating in this mega giveaway hop! Thanks for your participation in this hop. Love the sparkles on your New year card. Your prize package looks delish. Love, love, love this!!! Oh what fun I am having jumping from blog to blog. Thank you for the opportunity to participate. One of my resolutions this year is to make more time for crafting. I am the caregiver for my Mother and work full time and card making and scrapbooking is my way to relax and rewind. Love your fun festive card! Thank you for the awesome giveaway. Great giveaway & fun card. Love your sparkly card! Thanks for the chance to win! Happy New Year! Thank you for the opportunity to win the bag of fabulous craft goodies. Wishing you all the best in 2014. Great blog hop. Thanks for the giveaway! Thank you for the hop. Happy 2014! Thanks for participating in the blog hop and giveaway! I look forward to your blog posts in 2014 – love your cards! TY for a chance to win and happy new year to you and yours. Happy 2014 and thank you for the awesome giveaway! I am so grateful for all the crafting bloggers who share their creations with me! Hi Kelly! I have been enjoying perusing your blog. Your Nordic Pines layout is gorgeous! Happy New Year! Omg!!! It was exhausting getting to the bottom of your comments! Lol. That card was so beautiful and sparkly…definitely catching the New Years spirit!